As winter comes to an end and spring is around the corner, it’s time to prepare for my annual Spring Cleaning. This is an important part of the year for me because I collect so much stuff over the course of one year; it’s ridiculous. Decluttering my closet and home makes me feel so good. It is truly euphoric and I always feel extremely accomplished. This year, my spring cleaning comes with a move that also downsizes my closet space *tear* I am sad my closet won’t be as big, but honestly, the amount of space I have is a bit obnoxious for one person and has given me an excuse to hold on to shoes and clothes that I definitely no longer need or probably want for that matter. And I know what you’re thinking: yes, I took over the master closet and my husband has to put his belongings in the spare bedroom. Marriage is all about compromise and this is what he compromises on. 🙂 Back to closet cleanouts! For me, getting rid of clothes is a long drawn process. I’ve made a conscious effort to purchase each item (okay, most* items) in my closet and it’s so easy to come up with a reason why I need it. To ensure there is progress in this closet clean out, I’ve broken the process down into two parts: how to decide what to let go of and what to do with those items. First, I put aside all of the items I definitely am not giving up. This part is pretty easy. From there, I go through the remainder of my closet and ask a few questions to gauge whether or not the item is necessary. If I answer ‘no’ to any of the questions, it goes into the ‘let it go’ pile. 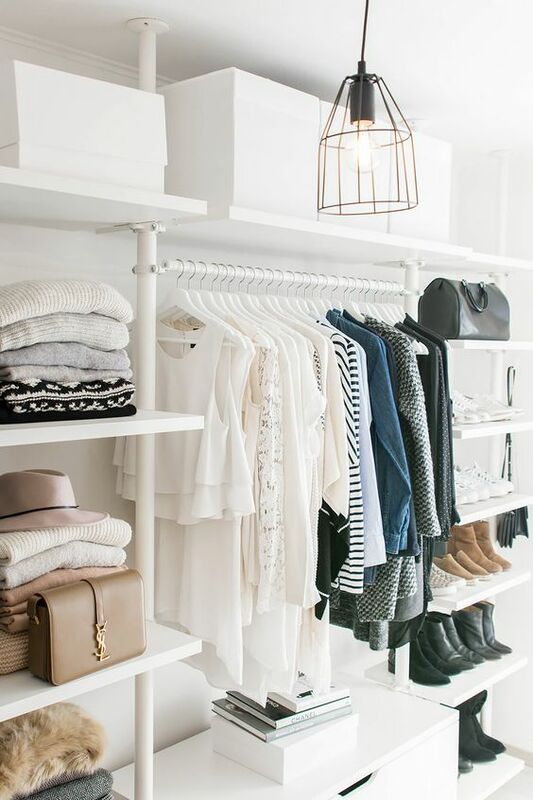 Hope this helps with your next closet haul! Sometimes we really like something in our closet but it doesn’t fit. If it’s too big, you can always take it to a seamstress to take it in. And if you don’t want to put in the extra dollars to get it fitted, then that’s a sign it’s time to let it go. On another note, if the item is too small then it’s time to part ways. We have to be realistic with what suits our bodies well and holding on to something you wish you could fit is only going to make you feel some sort of way with where you are. Don’t hold on to those items: let it go! Even with a walk-in closet full of clothes, we all have those go-to items that we continue to wear weekly while there are other items that are our go-to for certain occasions or settings. When looking at your closet, are there any items that you just never even pull off the rack, try on or even consider wearing? If so, those items need to go. Don’t force yourself to make up a random event when you’ll need that item again because most likely that won’t be happening. And if it does, guess what, shopping malls will still be around to find something. Items that have not been worn in 365 plus days need to be let go of. Is this a trendy piece that still accurately represents my style? As we grow, so does our style. I had phases where I was really into graphic tees with obnoxious patterns and colors — it’s honestly so embarrassing when Facebook brings up these photos. Now, I slightly despise them. No offense to any of you who love them, of course! 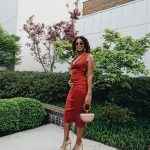 This change was just part of my personal style transition so as my style evolved, I had to make the decision to toss those items that were just taking space and collecting dust in the top corner of my closet. Is the item damaged? Am I willing to salvage it/ is it salvageable? I’ve been there before, I loved this shirt that was just so pretty and worked well with so many items in my closet from casual to dressy. Unfortunately, it had a stain that was not removable but I did not want to throw it away. I kept trying to wear it in ways that would hide the stain but it was hopeless. I had to toss it and you know what, I never replaced it. And I don’t think that item would be part of my regular wardrobe today. My point is, it’s hard to let go at first but eventually, it will be forgotten. If I was shopping right now, would I purchase this item? This is so major for me! 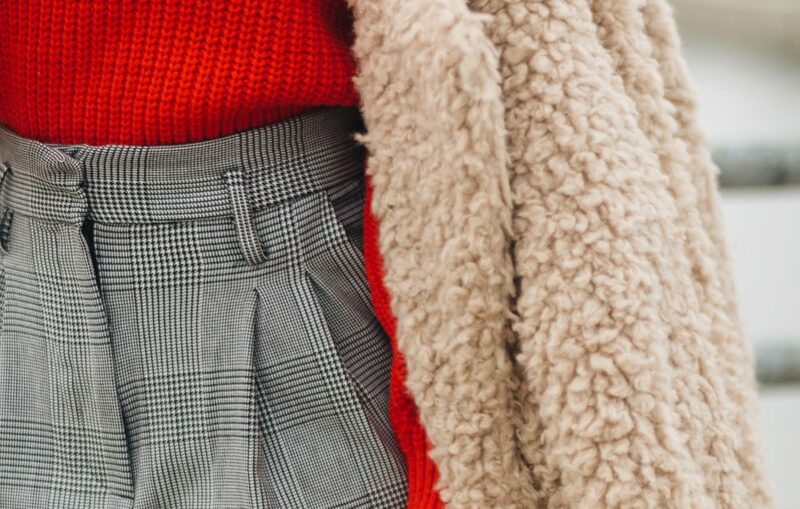 Sometimes we have emotional connections to pieces in our wardrobe. Maybe because of where you wore it to or the amazing deal you got for it. But if that same item was on the rack at your favorite store and full price, would you still purchase it? If not, that might be a sign you’ve outgrown it and it’s time to let it go. How does this piece make me feel? I’ve said this before and will continue saying it over and over again. 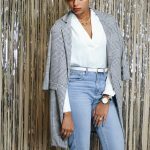 Personal style is so much more important than staying on point with the latest trends. Yes, I’ve given into some trends because it’s something I genuinely appreciated but more importantly, I focus on how the pieces make me feel. I want to make sure I am always expressing myself in a way that I am proud of and that makes me feel good. If I feel insecure in a dress that is super trendy, will I end up wearing that dress? Probably not. And then you just have another item sitting in your closet and basically threw away money to support a trend that doesn’t suit your needs. If an item doesn’t make you feel good, properly represent you or compliment your best assets then it’s definitely time to let. it. go. So I cleared out my closet – now what? There are so many organizations that will take the items you’ve outgrown to provide to those who can truly use them. When considering which items to donate, be sure they are items someone can actually make use of – donating ripped or stained clothing or items that are broken is not thoughtful. Volunteers have to pick through these items and determine what is worth placing on the shelves so be conscious of their time in weeding through that pile. Goodwill and The Salvation Army are two well-known organizations that will accept more than just clothing. Home décor and furniture are also accepted and their volunteers will pick up oversized items you do not have the means to drop off directly at their sites, for free! Dress for Success: This is one of my favorite organizations that has a presence in so many cities throughout the US. Their focus is to equip women with the skills and means in preparation for entering the working world. They offer resume assistance, training and even clothing/ accessories for interviews. This is a great organization to donate work appropriate clothing items, shoes, handbags and jewelry. On the same note, check out other local organizations within your community that may be in need of items. There are several women’s shelters that will list out their most needed items so you can support them where they need it most. Cinderella Project: Formal gowns such as gently worn prom and bridesmaids’ dresses can be donated to this organization to provide high school students with dresses, shoes and accessories for their high school prom. Each state operates separately so I encourage you to search your state’s Cinderella Project chapter where they will provide you with details on what they are in need for as well as where these items can be dropped off. Those shoes you got on a massive sale but never wore because they were half a size too small or that sparkly top you just knew you would wear to an event that never happened and still has the tag on it are perfect items that can be sold on a variety of platforms. Many of these items will even accept worn items with no tags that are in good condition. Let’s be real, even if you have disposable income, making a little cash for your clothes that can go towards new replacement items is always a plus! I personally have not sold any of my items yet, but now that I am aware of the ease of listing my items using social marketplaces I will certainly incorporate this into my closet hauls. Poshmark: One of the most popular platforms, Poshmark has a 20% commission fee for items sold over $15 and a flat $2.95 commission for items less than that threshold and a flat priority shipping fee of $5.95 through USPS. The seller is responsible for taking photos of the items to post and buyers can negotiate the price. They have a good list of brands accepted from children’s clothing to men’s and women’s clothing and accessories. The layout is nicely organized which makes it easier to view and search items as well as follow buyers that align with your fashion taste. Keep in mind, Poshmark only buys and sells within the United States. ThredUP: ThredUP takes all the work off the buyer and does everything on your behalf. They send you a plastic bag and prepaid shipping label aka a Clean Out Kit. You place your items in there to send back and basically wait to hear from them. They do offer a payout calculator to help you get an idea of what to expect for certain items and factor in the brand as well as the condition of the item(s) and from there you can determine if it’s worth selling. ThredUP offers international sales through a partner company. With all these fancy apps now available, don’t forget about the original online second-hand platforms Craiglist and eBay! While eBay has specific guidelines in place for buyers and sellers, Craigslist is local and free with no commission fees so if you sell something for $30.00, you’ll profit the full $30.00 which is always a major plus. It’s also a great site to list furniture pieces for those within or near your neighborhood to easily pick up directly from you. Just be sure to always be aware of who you are selling to and put your safety first if you are meeting with a buyer in person. Luxury Consignments: Have designer clothing and accessories? Check out TheRealReal and Tradesy. They complete an inspection process to verify the authenticity of the designer items which makes them more trustworthy e-consignment retailers for buyers and sellers. They have a great selection of items, are transparent of any worn/ damaged areas within the listing, sometimes offer additional short-term sales and even have the option of payment plans. So you have items too worn to donate or sell? Or maybe you have items that are straight up torn up and stained. No problem, H&M has an amazing garment collecting initiative that accepts all garments within their brick and mortar stores. From there, they sort through the items to determine what is re-wearable, reusable or recyclable. Talk about a great sustainability program! Let an associate know you have a bag to drop off and you’ll also receive a discount towards your purchase either that day or can use for a future transaction. There are also many local or state-based organizations that are working with their communities to host textiles collection drives. For example, New York has Wearable Collections which is an organization that works with residential and commercial buildings as well as schools to either host drives or provide a collection bin at the respective location to collect at a later date. Closet cleanouts are not the most fun but once you clear out space, you create room for more 🙂 And you can help those that can really make good use of your gently used items along the way. Hope you’ve found this information useful! Please let me know if this helped with your closet cleanout process, or if you have any great tips you’d like to share! GIrl, you have given me the courage to attack my *drops head* closets! lol. This is a great guide and I will have to probably reference it several times because I’m way too emotionally invested in my clothes.